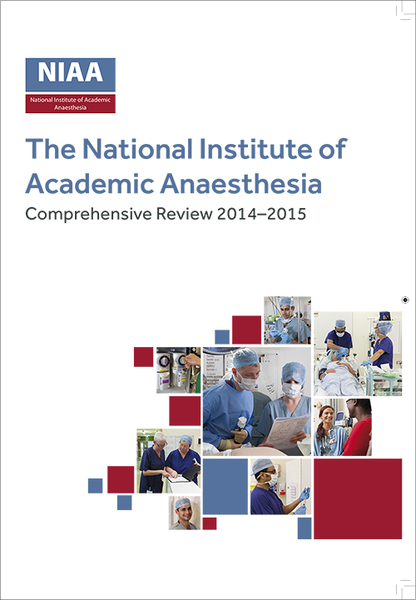 We are delighted to announce that the National Institute of Academic Anaesthesia (NIAA) Comprehensive Review 2014-15 is now available in both hard copy and electronic format. The Comprehensive Review celebrates the successes of the NIAA and its related projects over the past two years. With updates on Research Grant funding, Academic Anaesthesia, the Health Services Research Centre, as well as National Audit Projects and the National Emergency Laparotomy Audit a lot has been achieved, and the Comprehensive Review is our biennial booklet showcasing all of this outstanding work. 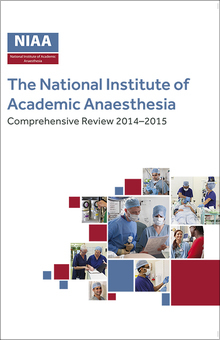 As part of the Comprehensive Review document we are also launching the five-year NIAA Strategy, which sets out our vision to improve the health of patients and the public through research and innovation, and our mission to promote, support and deliver world-class biomedical and health research in anaesthesia, perioperative and pain medicine. Copies of our Strategy leaflet are available with hard copies of the Comprehensive Review, and also as a standalone document. We would like to thank all NIAA founding and funding partners and contributors who have made this Comprehensive Review possible. Please click here to download a copy of the NIAA Comprehensive Review 2014-15. Please click here to download a copy of the NIAA Strategy 2015-2020. If you have any queries or comments about any of the contents or would like to request hard copies, please contact us on info@niaa.org.uk.